The reduction compass was invented by Fabrizio Mordente before 1567 as a drafting instrument. In use it was positioned on a piece of paper and its adjustable points could be used to transfer and compare dimensions and geometrical proportions. 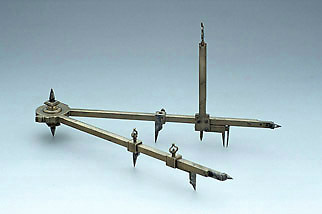 Although it might seem to resemble a sector, this example follows the original pattern of reduction compass by having no scales inscribed on its jointed legs. Although principally intended to be used horizontally, supported above a piece of paper, this instrument also has steel points at the end of its legs, so that it could also be used vertically as a pair of dividers.